Pick Analysis: One of the top high school running backs in the country as a high school senior, Kamara went to Alabama to be the next big thing. A preseason knee injury forced him to redshirt, however. He was also suspended for the Sugar Bowl and not on the sideline for the team's game against LSU for "behavioral reasons." Kamara left Alabama in January, but found trouble again a month later in his hometown (Norcross, GA) with a traffic arrest. He suited up for Hutchinson Community College in 2014, winning conference offensive player of the year (1,211 yards, 21 TD). Given a second chance in the SEC by Tennessee, Kamara averaged 6.5 yards per carry as a reserve in 2015 (107-698, 7 TD; 34-291, TD receiving). He was impressive again as a junior, running for 596 yards and nine scores on only 103 carries (40-392, 4 TD receiving), though he missed time with a sprained left knee (LCL, meniscus). 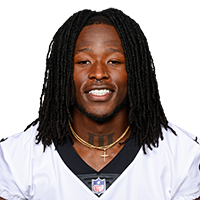 Published: April 28, 2017 at 09:56 p.m.
NFL Legend Lance Moore announces the New Orleans Saints' selection of Tennessee running back Alvin Kamara in Round 3 with the No. 67 overall pick in the 2017 NFL Draft. Published: April 28, 2017 at 09:55 p.m.
NFL Media?s Bucky Brooks, Matt Money, and Lance Zierlein give Alvin Kamara an A- draft grade. Published: April 8, 2017 at 09:34 p.m.
Everything you need to know about Tennessee running back Alvin Kamara. Published: March 31, 2017 at 04:57 p.m.
Tennessee running back Alvin Kamara goes through drills at the 2017 NFL Scouting Combine.